On Monday April 9, 2018, the Maryland General Assembly completed it’s 2018 legislative session with Sine Die. Sine Die literally means “with no appointed date for resumption,” despite the fact that the legislature will reconvene on January 9, 2019. There were 1832 bills introduced in the House and 1269 bills introduced in the Senate, some being cross-filed bills. Some of the more significant legislation to Maryland planners included bills related to the Forest Conservation Act (did not pass), Developer Rights and Responsibilities Agreements (did not pass) and Sea Level Rise and Coastal Flooding (passed). 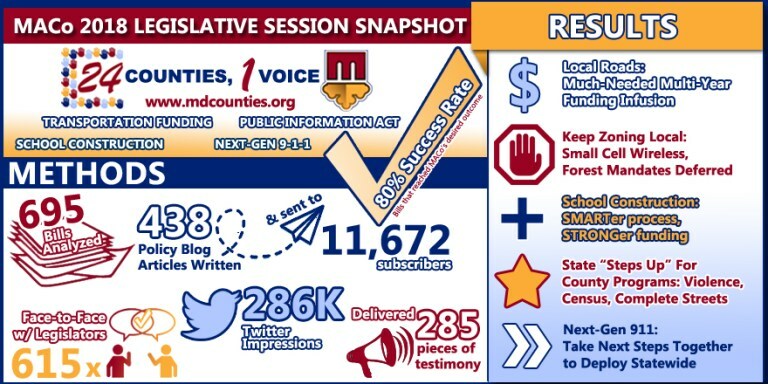 The Maryland Association of Counties Blog, Conduit Street, is a great source for summaries including those related to Planning & Zoning, Parks & Recreation, Road Funding, and Environmental legislation. Other sources of note include the Maryland Reporter. The most thorough source, of course, is the 90 Day Report, compiled by the Department of Legislative Services. There are as host of other session reports on their publications page. Visit the Maryland Association For Counties Website to read more HERE.